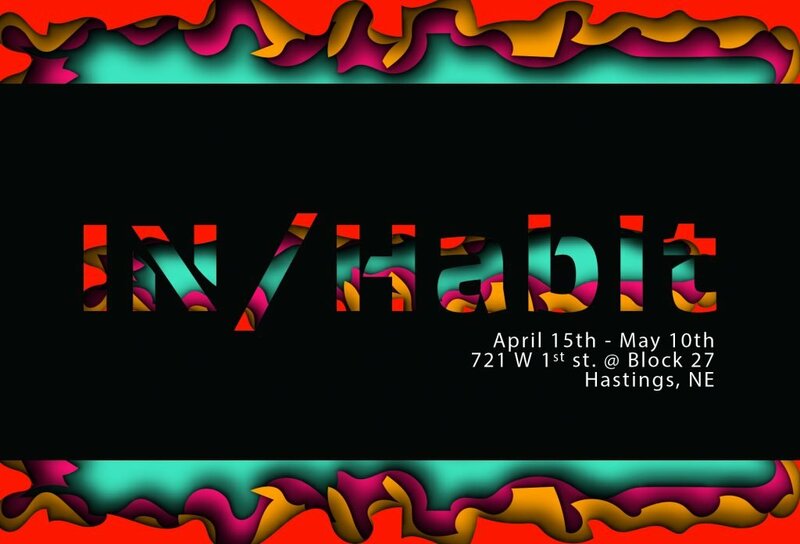 The exhibition is open April 16 through May 10 at 721 W. 1st Street — which is between Steeple Brewery and Allo Communications in downtown Hastings. Hours for the impromptu gallery are Tuesday-Friday from 2:00 to 8:00 p.m. and Saturday from 1:00 to 9:00 p.m. The gallery is free and open to the public. A free reception is scheduled for Saturday, April 27 from 2:00 to 5:00 p.m. Replacing “Jr. Thesis,” the new Professional Practices course is making use of the opportunity to promote the students’ development in goal setting, time management, studio work habits, gallery practices, writing for artists and other professional skills that will aid them in their creative endeavors after Hastings College. The location for the exhibition was provided in collaboration with the partners of Block 27 Lofts. Not only did the students create the work, but they collaborated in developing and deciding on show dates, gallery hours, design and distribution of marketing materials, as well as the installation and curation of the show. The exhibition presents a wide range of mediums, including, painting, printmaking, comic book development, digital media/design, sculpture and glass blowing.